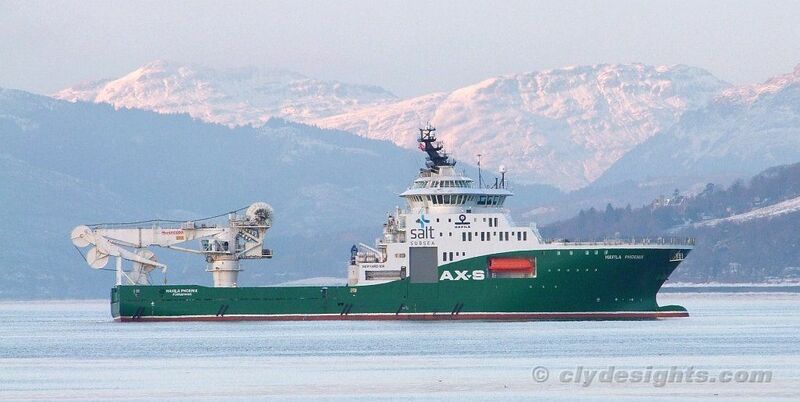 The large sub-sea construction ship HAVILA PHOENIX arrived on the Clyde and was forced to anchor off Gourock while fog meant that traffic movements on the river were restricted. She is a new vessel, built in Norway for Havila Shipping by Havyard Leirvik in 2009, and the 100 metre long ship is capable of working in depths of more than 2,000 metres. Her largest crane is rated at 250 tonnes and can be rigged with lightweight fibre rope that has many advantages over conventional steel wire rope of a similar capacity. On hire to an Australian offshore services company, she is possibly going to be loading plant in King George V Dock. Saw her berthed at Montrose Basin a couple of weeks ago, presumably waiting to offload the structure she loaded at Glasgow. shes quite a vessel.Your shot with the snowcapped hills in the background is great!